Is found the true sphere of one's original nature. Can one see the true movements of the mind." I've been getting back into walking lately. This comes after one handlebar-gripping turn on Cosette, my bicycle, one recent Friday. Inspired by my husband and the fellow bike commuters I work with--who still manage to get into work earlier than me, looking fresh-faced and energetic like they just stepped off the set of a commercial for multigrain breakfast cereal--I announced on a Thursday night that I intended to start riding my bike to work. But the reality of riding in the same lane as cabs and trucks, snaking my way to Horticultural Hall where I work, and nearly getting run over when I crossed a lane of traffic just when the light changed--and those cars hurtling toward me were not slowing down, what was a 38 year-old cyclist in a skirt doing in the middle of the street anyway--changed my mind about the pleasures of tooling around the city on my pretty bike with the baguette-ready basket as a means to get around. So I went back to my old standby. I walk for the same reasons many people walk--for exercise, for the head-clearing effects, for the simplicity of it. But there is another force that I can't leave out, one that makes walking the best option...really, the ONLY option. The Green Line of the "T" has always been one commuter away from a sardine can, but lately it seems like it's getting worse. I would console myself with the thought that the college students will be going back to their parents' houses in May, but even that offers little relief, because overlapping with the end of the Spring term is the start of Red Sox season. To fans this is a blessed time of year, one of the most holy after Patriots season. Another year of sunny afternoons at Fenway, drinking $8 beers whilst having the person in the bleacher behind you spill their $8 beer all over the back of your favorite shirt (if I was paying $8 for a Sam Adams, I'd hold that cup steadier than a surgeon's scalpel to avoid ANY of it spilling.) Or if it's raining, drinking $4 beers at any number of bars in the Fenway area, getting beer spilled on your shoes. "It's this stop, Jon! That door don't open. C'mere, I'm holdin' the door far ya." 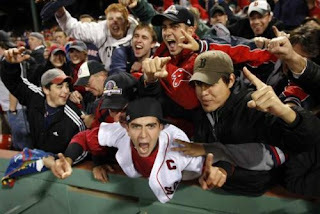 Why couldn't they segregate the Red Sox fans from the rest of us non-baseball nuts? Give them their own little red shuttle bus shaped like a pair of socks that would have interior soundproofing so the people on the street wouldn't be subject to the cacophony of a bunch of white people yelling over each other while downing their contraband hooch. Better yet, keeping in mind how the city would burn down to the ground in riots if they closed Fenway Park, find a way to pick up and move the beloved baseball stadium to some outer suburb--maybe close down a few Walmarts while they're at it--and plop it down in an area that doesn't even touch the city borders. They did that with The Kinsale Irish Pub, why can't they do it with a sports arena? Of course, to say any of this while in Boston, to even whisper it under your breath, is against the law. If a Bostonian heard that I had no interest whatsoever in the Green Dragon, or Monster, or whatever it's called (who cares, it's just a wall, right?) and that I wouldn't go to a game if someone handed me a pair of free tickets for seats located right behind home plate, I'd be carted away by the Boston Sports Authorities (BSA) and thrown into a gulag in Springfield. To avoid the Red Plague I might hail a cab, but it would be faster to ride on the shell of a sea turtle than trust my luck in a cab stuck in stadium traffic. One time I tried to take a cab home and it cost me $18 to go six blocks. I ended up jumping out of the cab after paying the driver so I could walk the rest of the way home. Meanwhile my cabbie was shaking his head, wondering how he was going to extricate his cab from the coarse snarl of cars. My husband says there are something like 81 home games from mid-April through early October, and that's if the Sox don't make the playoffs. But think to hard to yourself, "Please let them lose! "and the BSA might hang you by your feet in the gulag. So I keep my annoyance to myself, which is the way of survival for most city dwellers trying to find their own patch of peace and quiet among the crowds. And I consider the bonus of toned calves just in time for bare-legged season.